A lush, green lawn can be the envy of the neighborhood and increase the value of your home. If your grass starts to look patchy or you’ve just built a new house, the specialists at Lawn Masters can get your yard looking great again. We use grass seed specially created for the climate in southern Indiana so that you get a healthy and beautiful lawn. If you have an established lawn, there are two parts to our seeding process to get your grass healthy again – core aeration and overseeding. The core aeration process works like this – we use a special machine to pull plugs out of the ground (about the size of your thumb) throughout your yard. These holes help relieve the soil compaction which occurs during the hot summer days and “bakes” the clay soil of southern Indiana into hard, dense soil that strangles the roots of your grass. Aeration allows the grass to breathe again and lets in more water and nutrients. Lawn Masters is different from the competition – we use a special double aeration technique that puts twice the amount of holes into the ground. This means we don’t miss any spots and your grass gets maximum benefits. The holes will close in three to four weeks. Even if your lawn is already in good shape, core aeration is good to help keep your lawn healthy and avoid the grass roots getting choked by the hard soil. Sometimes, all a brown lawn needs is a good aeration to freshen up the grass. It’s especially beneficial for sod lawns because they often have a shallow root system. Aeration helps the sod establish stronger roots and get a better grip in the soil. After the lawn has been aerated, we overseed it heavily using Green Alliance Ultra grass seed. This grass seed was developed specifically to thrive in southern Indiana. It germinates quickly and gives you a beautiful dark green lawn. Green Alliance Ultra also holds up to the stresses we get from summer heat and disease. If you are building a new home or doing renovations, we can also seed a new lawn from scratch. In this case, we use a technique called power seeding (or slit seeding). A machine cuts rows into the bare dirt and drops seeds into the rows. This method helps the grass to germinate faster and fill in your lawn sooner. 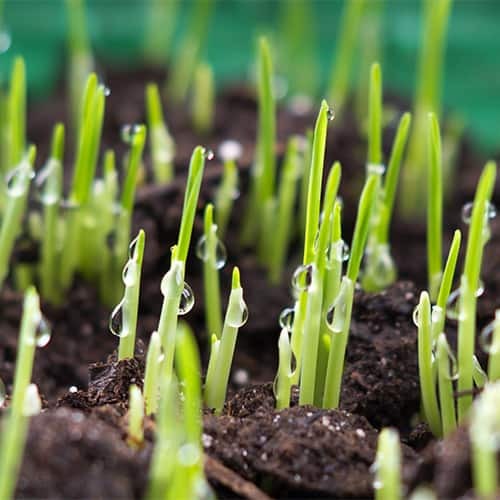 After seeding an established or new lawn, you can expect to start seeing growth within 2 weeks. However, seeding does require a little patience. It may take a couple of months for the grass to fully grow in. During that time, it’s extremely important that you follow our watering instructions. Our specialists will give you exact watering instructions week by week so your lawn thrives. Aside from watering, the only other maintenance we suggest to keep your new lawn healthy is signing up for our Basic 8 Lawn Program. Most of our clients who get our lawn seeding services sign up for the Basic 8 Lawn Program to keep the new lawn looking its best. Getting your lawn seeded is a big investment, so you want to make sure it thrives as much as possible. What time of year is best to seed my lawn? Depending on the weather any given year, the ideal time to seed your lawn is mid-August through the end of October. If you have a newly built house that finishes construction several months before the seeding season, your contractor will usually put down some type of seed to prevent the soil from eroding until it’s time to properly seed the lawn. Are there any situations where lawn seeding might not work? If you have an established lawn that is either zoysia grass or Bermuda grass, we will not be able to seed the whole lawn or it will ruin the uniformity. If you have Bermuda grass that has taken over your lawn, we can kill the unwanted grass and reseed at the right time to make your lawn uniform again. Bermuda grass is very aggressive and can come back if your lawn is not maintained properly. Be sure to water your new grass as recommended because Bermuda grass prefers the drier conditions and will come in to overtake the good grass. Do you only use Green Alliance Ultra seed? What if I want another type? Lawn Masters only uses Green Alliance Ultra. This is the only seed we feel comfortable using because it’s the best for the southern Indiana area, and we feel confident it will give you the lawn you’re after. We don’t want to use just any cheap seed – we want to give you the best! Green Alliance Ultra is not only specially manufactured for our area, but there are no weed seeds included in the formula. It has a high germination rate and also has fertilizer built onto the seed so the roots can establish quicker. After seeding, do I need to stay off that area of my lawn for a certain period of time? You will want to avoid mowing the area and keep foot traffic away for at least a couple of weeks while the grass seed gets established. What if the seeding doesn’t work? The number one reason for seed failure is lack of water. 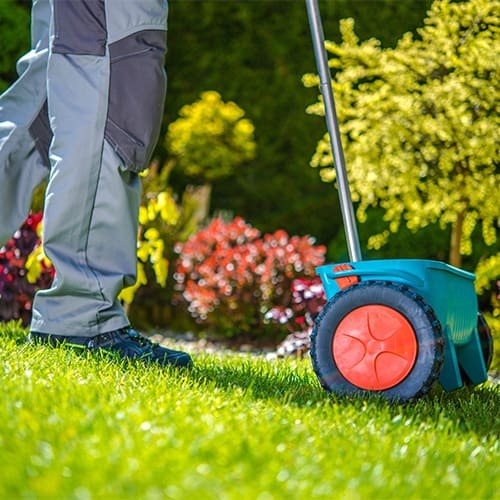 Taking care of your new lawn is like taking care of an infant – it requires dedicated care and it can’t take care of itself. While we provide care instructions, it’s up to the homeowner to help take care of the lawn too. However, if a client is dissatisfied, we will do what we can to make them happy. If you’re concerned about the progress on your lawn, we will come to investigate and advise the best course of action to get your lawn back on track. If you have a sprinkler system, we can help you set it up for the optimal watering schedule for your new lawn. What if it rains a lot after the seeding? Unfortunately, we can’t control the weather. If there is an extreme amount of rain shortly after the seed is put down, we’ll likely have to come back to put more seed down once the ground has dried. This will not be an extra charge for you because the weather is out of everyone’s control. Do I need to worry about birds or other animals eating my grass seed? Although birds and other critters do like to eat grass seed, we put down a lot of seed so that there will still be plenty left even if birds eat some. We also use seed that germinates quickly so there is less time for birds to eat any.